Today was definitely the most leisurely of the trip so far. We had breakfast on the veranda and enjoyed more sour cherries as a dessert to our breakfast :), then we packed a bag for the day and headed to the harbor to catch the ferry to Bisti beach. We sat next to a lovely older couple from Scotland who are on Hydra for a few days before getting on a cruise ship to tour the Mediterranean. Bisti is definitely a small, out of the way beach. The ride over was beautiful, and the intimacy of the location was clear when we pulled into the little bay. Not nearly as many beach chairs here as there were at other beaches we saw on our trip over. The close proximity to a thick evergreen forest and the water meant you were close to both. We sat right by water so clear Tim said he would swear you could drink it. As it went further out to sea, the turquoise and shades of blue were mesmerizing. We both agreed our four and half hours on Bisti went by faster than any four and half hours we could remember in recent history. Apparently this is what one does when there isn’t sand… building rock towers! 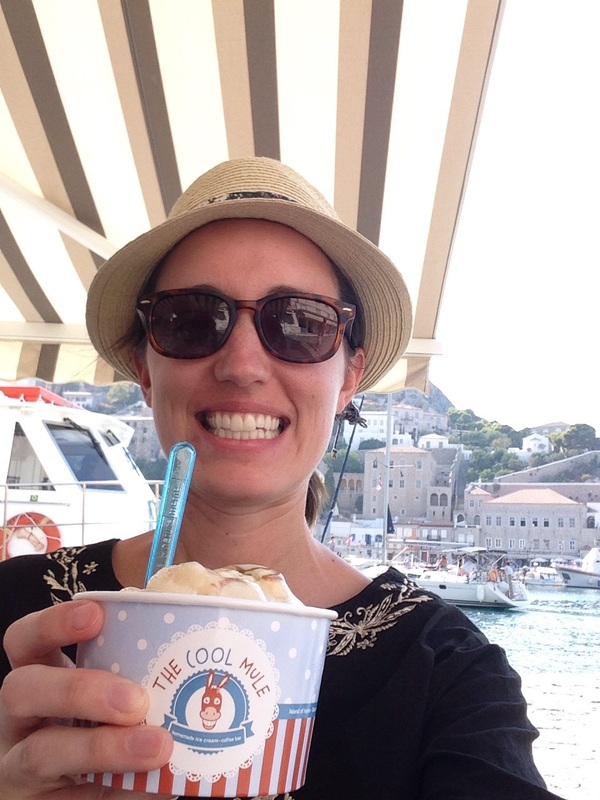 Once back at Hydra town, we went to The Cool Mule yet again for more ice cream. We both got two scoops since the only lunch to be had at Bisti were sandwiches (though, honestly, I think we were both still full from dinner last night! ), and we enjoyed every single bite. Tim called and made reservations at an old Castillo that was once used as a warehouse to press olives. The view at dinner was even better than last night, and we practically had the restaurant to ourselves. Dinner was terrific, and they had sour cherry cheesecake on the menu. Fortunately, the restaurant was a bit of a walk from where we are staying, so we were able to walk off a bit of the meal. Sour cherry cheesecake! We are crazy ’bout these cherries! We are going to do a bit more beach time tomorrow before we head back to Athens in the evening. We’re going to be sad to leave Hydra behind! Wow! That looks beautiful! Wish you could bring some of those cherries home!! Me too! Not sure how well they would travel, though! That beach looks like a place I could spend a long time at. I better be getting some of these sour cherry things you’ve been teasing me with for 2 days now!